D&D Painting is Brooklyn Ohio #1 Top Quality and Professional Residential Housepainting Contractor 216-246-0317, offering Interior Painting and Exterior Painting Services, Drywall, Power Washing, and more! Questions regarding our painting services can be found on our FAQ Page. 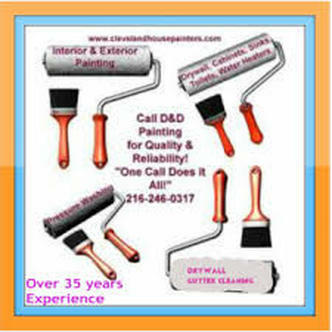 ​Proudly painting Cleveland homes and businesses for over 35 years!